A peculiar and addictive arcade game rumored to make players ill, and worse. Government men retrieving data from the cabinet, without ever saying a word to anyone. The game abruptly vanishes without any explanation. Elaborate hoax, paranoid conspiracy theory, or terrifying example of government utilization of an entertainment industry in order to study mind control tactics? This is what documentarians Jon Frechette, Todd Luoto, and Dylan Reiff are hoping to find out. 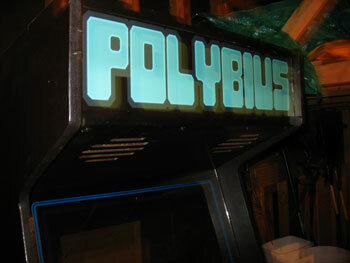 Accounts tell the story of a plain black cabinet appearing in select arcades in and around Portland, Oregon in 1981, marked only by the blue lettering spelling out the word POLYBIUS. Thought to be named for the Greek historian known for his assertion that historians should not report what they cannot verify through witnesses, Polybius has been described as an extremely addictive combination of 3D style mazes and a space shooter, with spinning graphics and bright colors that increase in intensity as the game progresses. Comparisons have been made to Atari's 1980 title Tempest. According to internet retellings, men dressed in black would visit the machines, retrieve data from them, and leave without ever speaking a word. Allegedly, many players of the game ended up addicted, sick, and plagued by nightmares. More drastic accounts include tales of amnesia, hallucinations, and even suicide. One day, shortly after its release, Polybius vanished just as mysteriously and silently as it appeared, with no official record of the game's existence anywhere. The first documented reference to the game was in an anonymously authored entry on the site coinop.org in 2003 (links citing a 1998 reference lead to an unresponsive page and are unable to be verified.) The entry mentions the name Polybius and a copyright date of 1981. The author of the entry claims to be in possession of a ROM image of the game, and to have extracted fragments of text from it - most interestingly "© 1981 SinneslÃ¶schen". The remainder of the information about the game is listed as "unknown". SinneslÃ¶schen roughly translates to "sense deletion." Many publications, when discussing the tale of Polybius, write the story off as a hoax due to the lack of evidence of the game's existence; but as the American astronomer Carl Sagan once said "Absence of evidence is not evidence of absence." Nearly five years ago, Jon Frechette was approached by his friend and longtime collaborator Todd Luoto with the idea of creating a narrative film about the Polybius legend. "It was through the process of doing research for this screenplay that, slowly, we began to unravel the bizarre true stories that may have inspired the Polybius legend, and eventually arrived at the realization that the truth was stranger and more compelling than what we'd been cooking up in isolation." After more than a year of intense research, investigation, and interviews, the team is confident in their ability to capture Polybius in the documentary The Polybius Conspiracy. As of the time of this writing, the team's kickstarter fundraiser has raised more than $23,000 of their $100,000 goal.